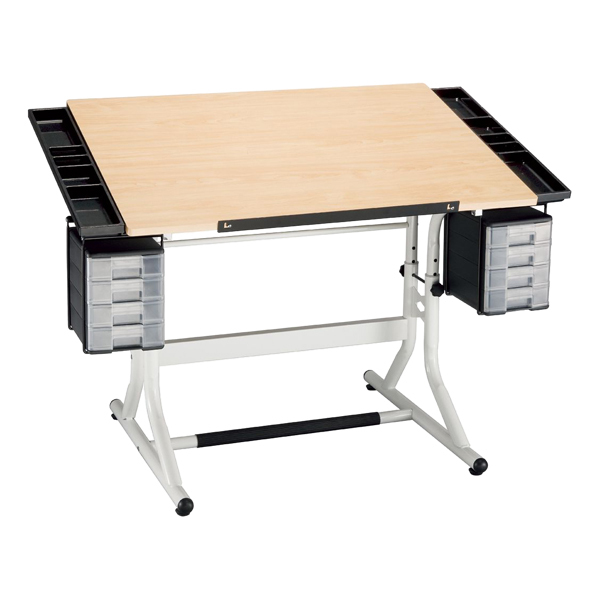 When you select a drafting desk or art table, choose between adjustable tilt-tops or a solid, one-part tabletop. Read more to find out the advantages of both. Tilt – Tables with a tilt-top allow students to adjust the angle of the surface to suit their own styles. These desks often have a split-top, where only a part of the table adjusts angle. The second part of the table remains flat, making it a good place for note taking or displaying a laptop. Many tables adjust to multiple angles, so most anyone can find the right position. Solid – Tables with a solid top feature either an adjustable or a fixed top. These tables feature a single work surface, providing less versatility than split tops. Most solid top tables present individuals with a more economical choice than those of the split top variety. Various top materials have different advantages. While melamine and fiberesin are inexpensive and lightweight, solid wood, safety glass and high pressure laminate represent the most durable choices. Read on to find out more. Melamine – Most drafting tables come with a standard plastic laminate top. Melamine is affordable, easy to clean and a suitable choice for most classrooms. It's also lightweight, so your tables will be easy to move. Fiberesin – Fiberesin combines fibrous materials like wood pulp and recycled paper with a glue-like resin. These tabletops are more durable than standard melamine, but still come at a price that fits into most budgets. High-Pressure Laminate – These materials, formed under heat and pressure greater than five pounds per square inch are often called high pressure laminate. They include Formica and similar plastic laminates. High pressure laminates also employ wood veneer occasionally as a top surface. Wood – On this site, the majority of the drafting tables described as having wood tops feature solid hardwood construction. Hardwood means that the wood comes from a deciduous tree, rather than a coniferous tree. Solid hardwood uses complete boards rather than particleboard and laminate. This makes for a sturdy, durable surface. Safety Glass – Safety glass, sometimes known as tempered or toughened glass, undergoes various treatments to make it more durable. These often include lamination, thermal or chemical processes. Safety glass, instead of shattering into sharp fragments when broken, breaks into small chunks that will not cause harmful lacerations and other damage. Wood and steel frames both offer excellent durability. Wood frames often have a higher aesthetic appeal, but come at a higher price. Steel – Steel frames can range from lightweight and affordable tubular steel to heavy-gauge, durable solid steel. 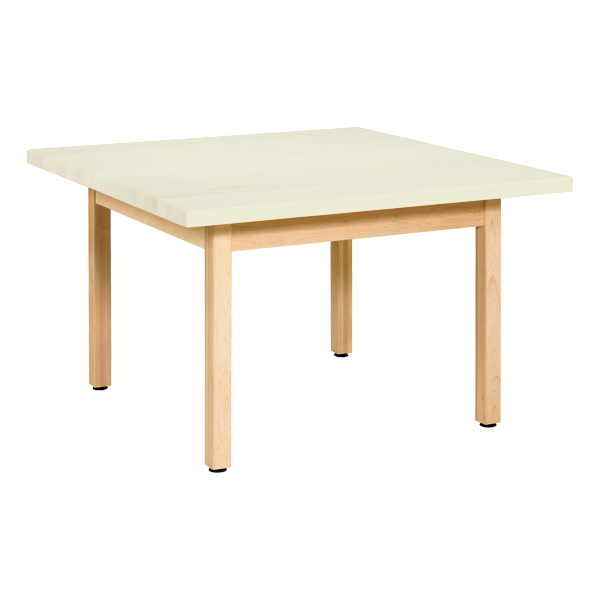 If you're looking for a table that is height adjustable, you'll probably want to consider a model with a steel frame. 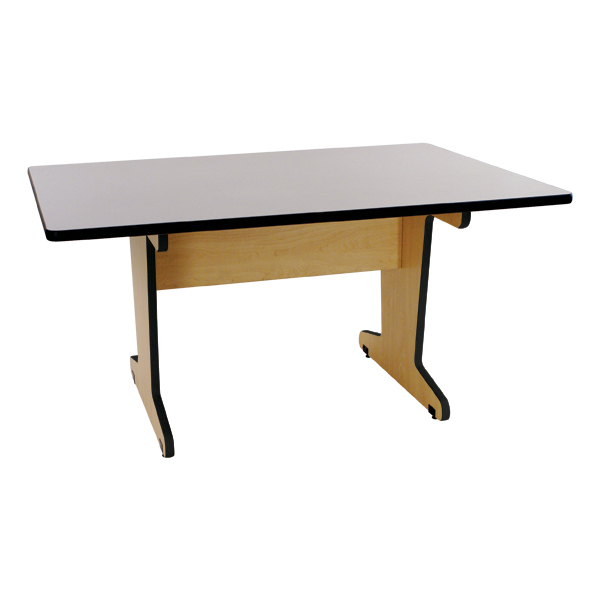 Wood – With the precision that is required in drafting work, a steady table is a must. Wood frames are more expensive, but they offer a solid, unwavering base. Drafting tables with wood frames typically cannot be raised or lowered. Book Compartments - Since art class is more than just hands-on application, it's a good idea to give students a safe place to store their belongings. Built-in book compartments take up no additional space and provide storage for textbooks and notes. Tote Trays – Built-in tote trays keep students from milling around the classroom – which can be distracting and unsafe during certain projects. Paints, brushes and other supplies fit into the totes and are stored within arm's reach. Drawers – Drawers are a good storage solution because they protect supplies from splatters and stains and paper from wrinkling. Like tote trays, they cut down on the movement in your classroom. Complete your drafting space with accessories for storage and lighting. Many drafting tables accept clip-on lamps and have areas for expandable storage. Lamps – Some drafting tables come with a built-in lamp that keeps your work surface properly lit. Since the lamp is made specifically for use with the table, you don't have to worry about buying a separate lamp and then hassling with the proper fit and mount. Shelves and Drawers – Do you have a small classroom and limited storage space? Drafting tables that come with built-in shelves and drawers keep students seated during class because important supplies can be stored within arm's reach. Check out all of our Drafting and Art Tables. Take a look around – if you see something you like, remember that ordering online is safe and easy. Of course, our team of trained sales associates is also happy to assist you. Just give us a call at 1-800-260-2776.